there is a lot of hatred in the horror community for the film adaptation of stephenie meyer’s tale of brooding, day-walking and oh-so-glittery vampires. but, i have a confession to make. i like twilight. before you strip me of my horror blogger/movie fan/y-chromosome cred, let me explain why. when john at zomboscloset sent out a call for “golden turkeys” (movies so bad, they’re good), twilight is the first thing that jumped to mind. for the horror fan, twilight is a near non-stop work of comedic genius. where else are you going to see vampires playing baseball in the day and watch people base an entire romantic relationship around how the girl’s blood smells? what other vampire movie posits the cure for getting bit by a vampire is to get bit by another, slightly nicer vampire? you may call this film vapid, silly, dumb and insulting… all of which it is. but it’s also a near-perfect mix of unintentional humor, ed wood quality dialogue and self-satirizing views on romance. my apologies to any twi-hards or hard-lights or whatever twilight fans are called… but wow, this movie is bad. in my mind, it’s so horribly silly and overdone that it actually pushes the dial all the way around on the quality meter, breaking through to the other side… this is truly a movie deserving of the description “so bad, it’s good.” so, in honor of the upcoming thanksgiving holiday, i hereby declare twilight as the first annual 2009 eo2l golden turkey award winner. as further evidence of it deserving such a prestigious honor, i give you the top 5 silliest things about twilight. 5. vegetarian vampires. edward and his family drink deer’s blood and refer to themselves as ‘vegetarian’ vampires. since neither vampires nor vegetarians drink deer’s blood, neither term is really very accurate. 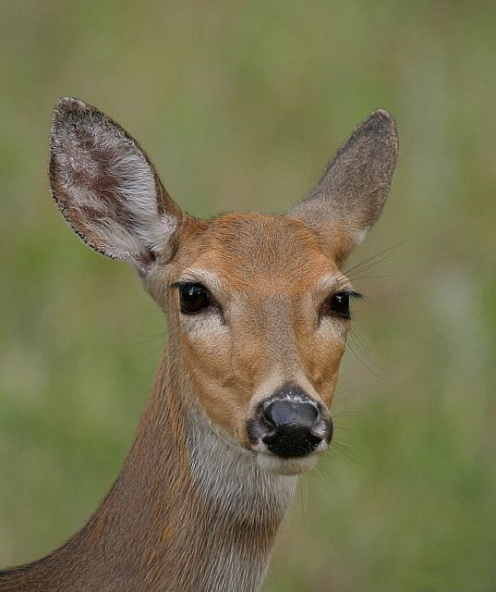 also… what happens if they accidentally leave a deer close to death, but not completely drained? i am hopeful that new moon‘s plot revolves around a blood-sucking fawn preying on the local high school populace. 4. this moment. i haven’t read the books, so i can’t explain in detail what the intended interpretation of this moment in the film is, but my best guess is this: edward catches a whiff of bella’s hairspray, gets a sudden and surprising erection and then throws up in his mouth. given that he’s a high school boy, as far as first reactions to meeting a girl go, that’s not really that horrible. 3. spider monkey. “you’d better hold on tight, spider monkey.” as horrible as that line is, it was almost worse as these were two of the other six possible options (i kid you not) given to the actors. with writing this solid, the movie was pretty much guaranteed to become the cultural phenomena we are witness to today. Edward: Wrap your legs around me like a spider monkey. Edward: Got a good grip? Don’t let go. Bella: No chance of that, buddy. 2. vampire baseball. i may be alone in this opinion, but there are few things as funny as watching vampires hop around the grass and leap into the sky like coked-up flying squirrels, chasing after a baseball. this concept is at least moderately understandable when it existed only in the imagination of one strange little woman… but the fact that a group of dozens (if not hundreds) involved in the making of this film took that idea off the page, thought it was wise to put it on film and carried through with it is truly inexplicable. 1. sparkly vampires. i’m not one of those purists that says ‘you cannot tinker with vampire mythology’… as far as i’m concerned, tinker away. some of my favorite vampire films (e.g., near dark) ignore certain established conventions, so that is not my gripe with twilight. the problem is that, no matter how you cut it, vampires that sparkle in the sunlight like a twelve year-old girl’s blinged-out cell phone are silly. you can say melodramatic things like “this is the face of a killer” while sparkling, if you like… but that’s not going to affect the inherent silliness of daylight-twinkling vampires one little bit. it’s such a mind-numbingly stupid concept, that when i first saw twilight, it was hard for me to believe that anyone could take the movie seriously… but as this weekend’s box office for new moon shows, i was dead wrong about that. i have yet to see the sequel, but i am hopeful that it will be filled with the same silliness and over-the-top cheesiness that entertained me so in the first film and earned it the 2009 golden turkey award. This entry was posted in Sparkly Vampires, Vampires. Bookmark the permalink. The Sparkle Motion animation is the best thing I have ever seen. I saw this film for the first time today – it was so banal and devoid of anything. Did Stephanie thingy even research vampire lore before writing it? They’re out in the daylight. They have reflections…! Crappity-crap! I told my mom about this movie last week. She thought I made up how the vampires play baseball and the past where Bella walks into the room and Edward makes a face like she smells terrible but last but not least the sparkliness.